The worst has happened. I have new allotment neighbours. Ok, that’s not the worst that could happen. Far from it. In fact, it’s perfectly fine. I just have one tiny problem with new allotment neighbours, and that is their sheer bloody enthusiasm. They all turn up with bags and bags of the stuff. Not to mention, in this case, a small army of people who turn up to dig. 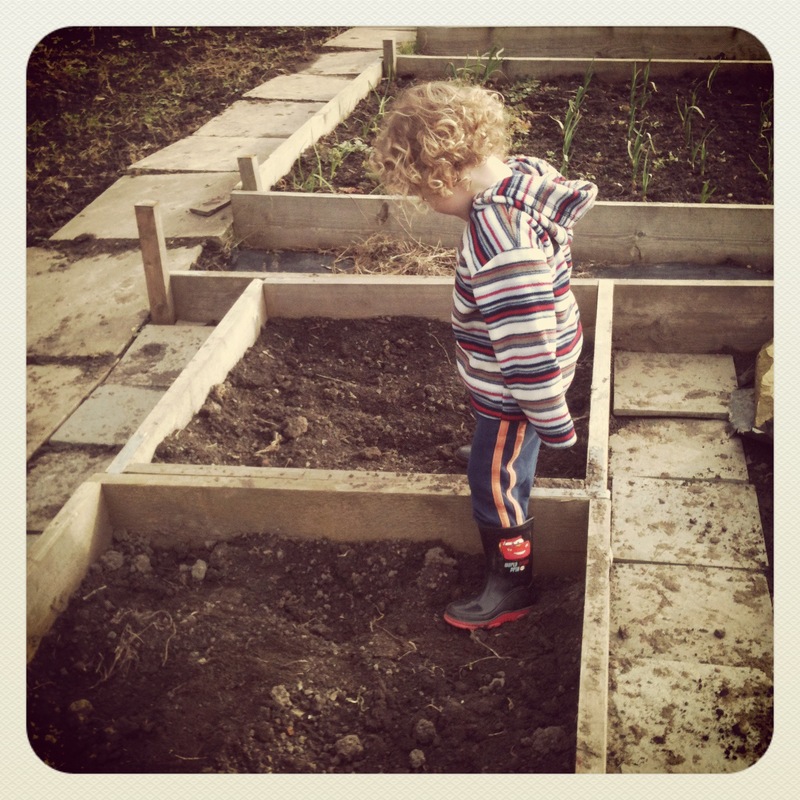 Now, I’m all in favour of calling in a few extra hands when the plot requires it – such as ‘Dig In Day’ when we brought our whole family to help build some new raised beds. But my new neighbours seem to have an endless supply of people. On Sunday, we had a lovely family time pottering about in the peaceful sunny afternoon, when up trooped about ten people to start work on the plot next door. Bringing all their noise and chat and capable manual labour with them. We left them to it shortly afterwards. I’m all too aware that this is making me sound like a horrible person. I’m sorry about that, but there is worse to come. The other thing that new allotment neighbours do is bring out my competitive nature. I’m not hugely competitive (pub quizzes excepted) but there is something about a new, enthusiastic allotment holder to bring out the worst in me. I hate the thought of someone new having a better plot than mine, when I’ve had mine for years! Since the start of Spring when they arrived and did all their digging and raised bed building, I’ve been on the allotment almost every day. Every day. I’m aware that this is ridiculous, because firstly, its not an actual competition, and secondly, even if it was, there is no way that we (with our helpful five and two year old diggers) could compete. Thankfully, in order to make the best use of this new found competitive spirit, I’ve been reading a book called ‘The Half Hour Allotment’ by Lia Leendertz which I recommend for anyone with an allotment and a busy life on top. Grow the fancy, expensive crops you love to eat – so you get more for your money and work. Buy plants and seedlings where it makes sense to do so, instead of trying to produce everything by seed yourself – something I’ve already started to do. At the end of every half hour session on the plot, take a couple of minutes to work out what job is the next on your list – then, when you arrive the next day for your half hour stint, do that job, instead of spending loads of time procrastinating! This continues day after day, obviously. Invest in some perennial crops (such as fruit bushes) that take less looking after. Prioritise and plan your time – certain times of year you might only be able to water and harvest your crops in half an hour, so the plot might be untidier than you’d like, but some jobs have to stay at the top of the list. There is no point having a pretty plot if you’re not harvesting the food you have grown. All of this means that you can get some great results from working just for half an hour each day (for five days a week) leaving you the weekends to bask in the glory of your achievements – or, more likely, dash about with an endless list of other things to do, but safe in the knowledge that your plot is fabulous! 6 Responses to The Half Hour Allotment: making the most of every visit. I don’t have an allotment but I do grow vegetables on my balcony which over the past two years some of my neighbours have also started doing. It was never supposed to be a competition but I can’t help wanting to make my balcony look the best so have also started growing plants and flowers to inject a bit of colour! Im glad we have a garden big enough to grow veg in, im going to sound totally anti social now but if i was plodding around in an allotment enjoying the air and sun with my family and a haord of ten people turned up ruining my chee with all their noise and then due to sheer man power did it better than me i would total get miffed and go home its bad enough that my neighbour comes in the garden put the radio on football sports commentary for hours on end and has gone in their house, leaving me fumeing and sulking in my garden. I know exactly how you feel Helen. I’d love a proper patch of land to ourselves…still, at least the competitive spirit does make me grow lots of stuff!